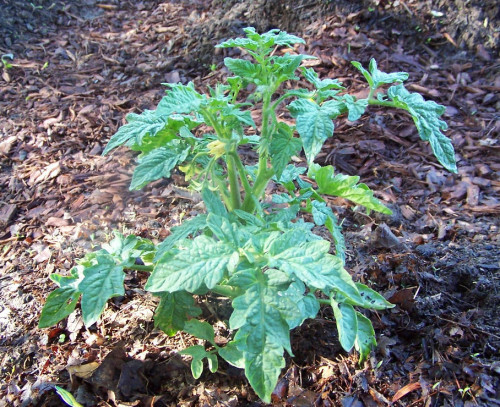 Determinate tomato plants are also known as “bush tomatoes”. They are smaller than normal tomato plants and generally need no staking but still produce well. Nothing tastes quite like a home grown tomato. They are sweet and juicy and so easy to grow. But they also take a lot of room, so are not so great for those who have small yards and no room to plant the larger varieties. That is what make a determinate tomato plant perfect for a container, especially if you don’t have room for a whole vegetable garden. 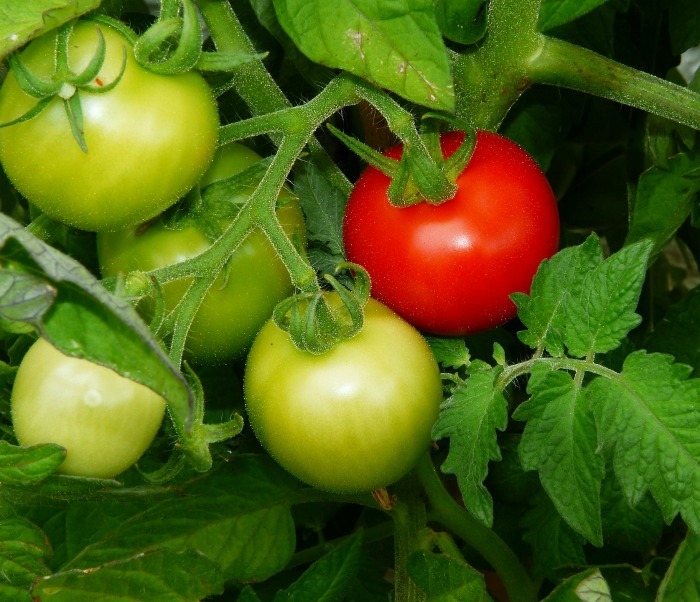 Most beginning gardeners just think of them as tomatoes but there are two distinct types – determinate and indeterminate. The plants have some some similarities (basic light, watering, and fertilizing needs) but also some major differences. Indeterminate vs determinate Tomato plant. What is the difference? The answer to this question is a two part. One that you can understand early on, and the other when the plant bears fruit. How tall do determinate tomatoes grow? It varies with the variety but generally a determinate tomato height will top out at about 5 feet or so. Many will grow only to about 3 – 4 feet. Some dwarf bush tomato varieties will only grow to 24 inches! Determinate plants will stop growing when the fruit sets on the top bud. All of the fruit on determinate tomatoes ripen at about the same time and usually over a 1- 2 week period. They require a limited amount of staking for support and are perfectly suited for container planting because of their smaller size. Many gardeners grow them on patios for this reason. Do you have lots of room in your garden and like a longer growing season? Then Indeterminate tomatoes may be a better choice. This type of tomato gets large. They can reach heights of up to 12 feet although I have found that mine get to about 6 feet. Indeterminate tomatoes will keep growing and will produce fruit until they are killed by frost in the fall. 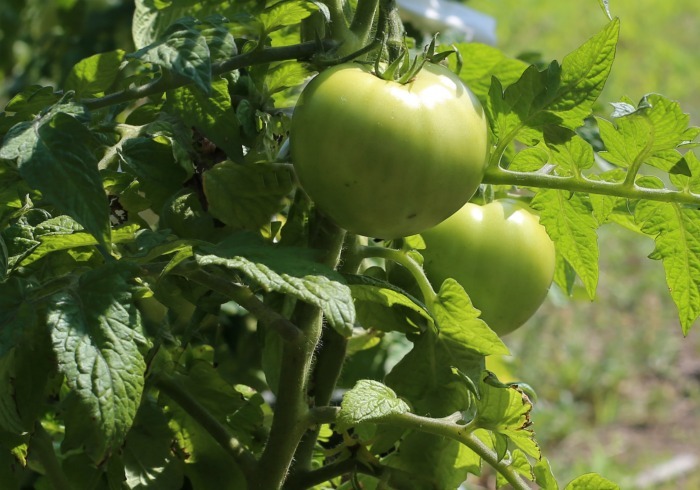 This type of tomatoes will bloom, set new fruit and ripen fruit throughout the entire growing season so you will have a longer time to harvest. They require substantial staking for support which means that you need space to grow them. But never fear, you can usually identify the type of tomato plant that you have simply by reading the plant label. The word determinate or indeterminate should be clearly labeled on the seed pack or tomato transplant container. 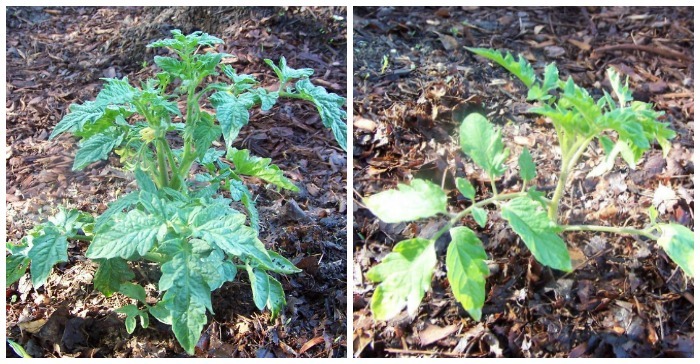 Here are pictures that I took of two tomato plants that were planted on the same day, just a few weeks ago. The determinate plant in the first picture is already very bushy and has set some buds for flowers. The indeterminate plant in the second photo is much more spindly and you can see it has quite a way to go. As the plants continue to grow, the bushiness of the determinate will continue to develop, as will the more leggy look of the indeterminate type. 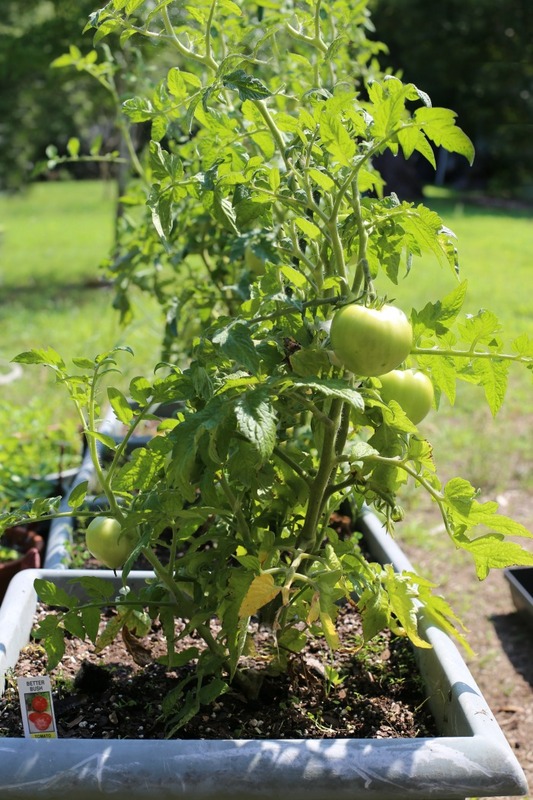 Both types of tomatoes can be grown in containers if you don’t have room for a large vegetable garden, but the determinate variety is best suited for this type of gardening. 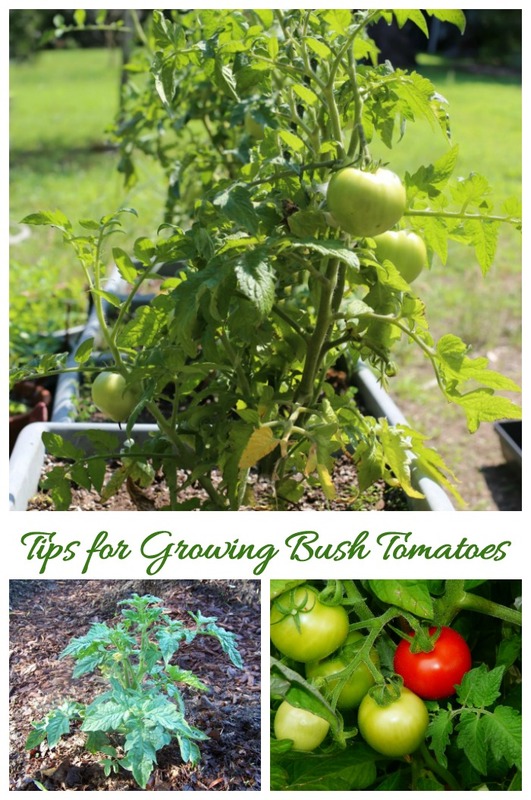 Bush tomatoes can also grow just fine in a normal vegetable garden bed. How large should the pot be? The container size for determinate tomatoes depends, once again on your variety. I have very good luck using 18″ or 24″ pots. The can be staked if I need them to and the size pot gives the roots of the plant plenty of room to grow. Don’t let the small size of determinate tomato plants fool you into thinking that the fruit will be small. There is more to determinate tomatoes than just the cherry tomato variety. I am currently growing the “Better Bush” variety which has just set fruit and it is very large. The tomatoes are huge and I’ll likely get an entire extra season with new plants since we don’t get frost until almost November here in North Carolina. If you want to grow plants in containers, you will probably want to stick with a few different determinate varieties. They are more well-behaved and better suited to container growing. You can certainly grow indeterminate tomatoes in containers, but you will have to be prepared to be vigilant about staking or caging, as well as pruning the suckers to maintain compact growth. 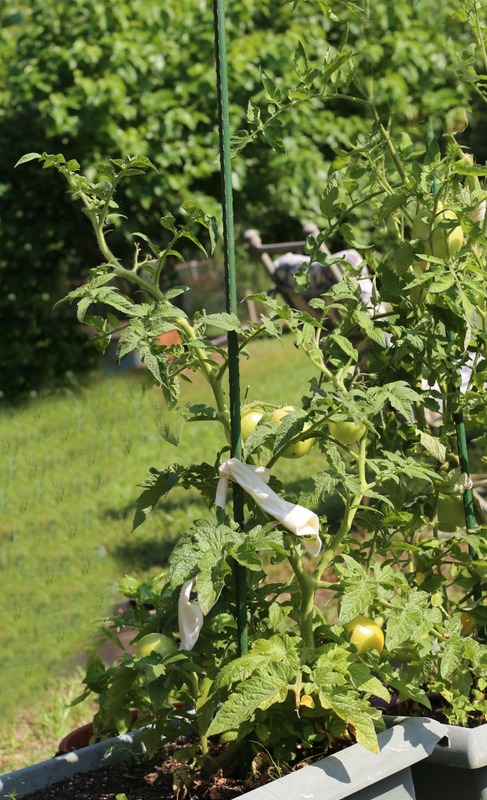 In addition to the smaller size, bushy nature and harvesting time, determinate tomato care has a few other steps to get the most out of the plants. It is commonly taught that plants need to be pruned to stay bushy. Some people prune indeterminate tomatoes to keep their size in check, but this can cause the plant to put its energy into producing fruit rather than leaves. However, never prune the top of a determinate type tomato. You will want all the fruit you can get from these shorter plants and they will stay bushy without needing to prune. Both types of tomato plants need to have their suckers removed. To properly prune a determinate tomato, pinch all of the suckers that grow from the ground level to the first flower cluster. A sucker is a tiny stem that grows at 45 degrees between the main trunk and stem of a tomato. Pinch these out at the base of the sucker. This is easiest to do when the sucker is small! Pinching out these suckers will give you a stronger tomato plant. Determinate tomatoes keep a compact bushy size so they don’t need cages or staking the way the determinate varieties do. 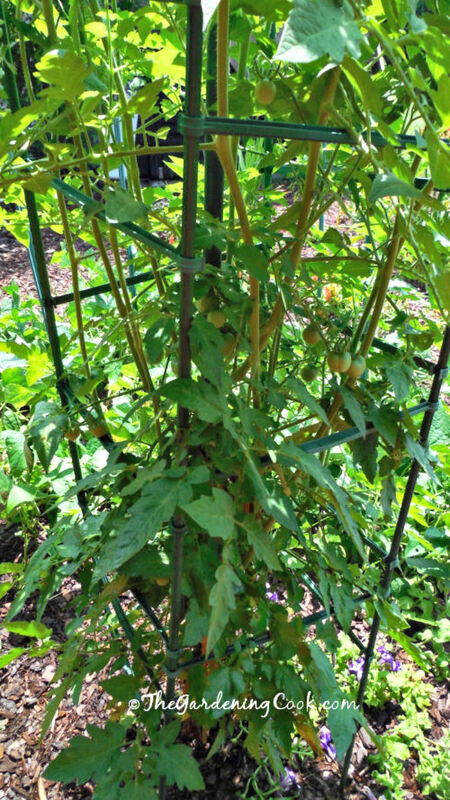 I have never used cages for my determinate plants, but sometimes will stake them as they set fruit if the stems have several tomatoes in one place. This supports the stems more than the tomatoes. The stakes look a bit odd since they are for taller tomatoes but they do the job just fine! The basic care of determinate tomato plants is the same as all tomato plants. 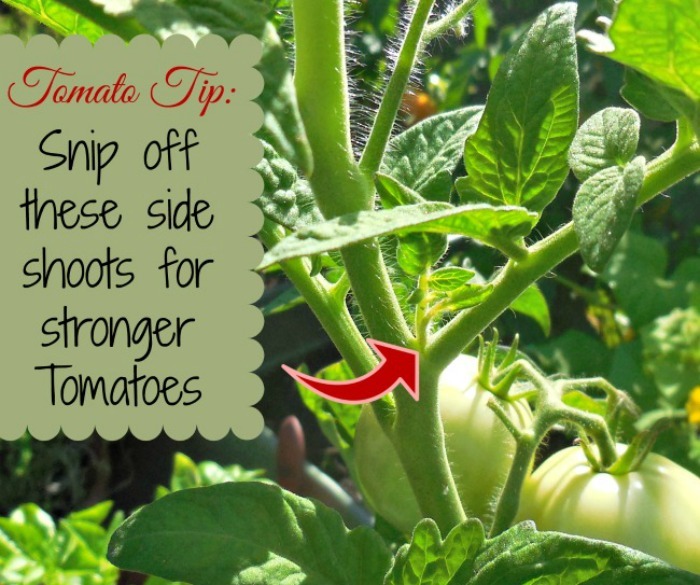 For a more complete article on tips and tricks for growing great tomatoes, see this post. Determinate tomatoes need full sun – at least 6- 8 hours of direct sunlight each day. Plant two weeks after the expected date of the last frost. There is some thought that early planting is better, but I find that if I wait, the later plants will catch up just fine. They like it to be warm before they really start growing well. Water frequently for a week or two after transplanting, gradually diminishing frequency and increasing the depth of penetration. After that, thoroughly soak the soil about once a week or more often if the weather is very hot. Tomato plants should not be sprinkled late in the day. Water deeply to encourage deep root growth rather than a little bit more often. Even in containers, mulching will help to control weeds and moisture levels. Cover the soil around the plants with a plastic or organic mulch to maintain uniform moisture levels. I use grass and leaf mulch for mine. Don’t go too close to the stem of the plants. When it’s time to harvest determinate tomatoes, you will know it. They all ripen at around the same time, usually over a 1-2 week period. Be ready for a large harvest. When I have extra tomatoes I like to use them in my homemade marinara sauce. It makes use of oven roasted tomatoes that brings out their natural sweetness. Tomatoes are easy to roast in the oven and this makes for a fabulous taste for many Italian dishes. There are loads of old wive’s takes about how to grow the sweetest tomatoes. Do you ever wonder if they are true or not? Check out this article to find out. What if you look at your plant tag and it says “semi-determinate” as the type? What does this mean? A semi-determinate is sort of a cross between the two types but is technically an indeterminate variety that does not grow too large. The semi part comes from the fact that they act like a bush tomato since they have shorter vines but may still grow tall enough to need support even though they don’t grow out of control. They will produce fruit over a longer period of time so you won’t get the all or nothing harvest that you do with determinate tomato plants. Have you grown both types of tomatoes? Which do you prefer? I am growing both determinate and indeterminate tomato plants in containers for the first time this year as a test to see how they do. I can already tell you the bush varieties are the winners! Want a reminder later so that you will be able to find this post easily? Pin this image to one of your gardening boards on Pinterest. Admin note: This post first appeared on my blog in May of 2013. I have updated the post with new photos and much more information to help you learn about determinate tomatoes. Help! I bought a tomato plant the other day for the first time. I would like to get other plants from it but don’t know how..If someone could show me how to do it, I would really appreciate it as I have to start planting vegetables as I can no longer afford to buy them at the grocery store. I live on a very very small disability pension and by the time all of the bills are paid I hardly have anything left for food. I have good days, but more bad and if it isn’t too much work I really want to do this. I thank you all so much for any information you can give me on getting more out of the one plant I bought. This article should help you. 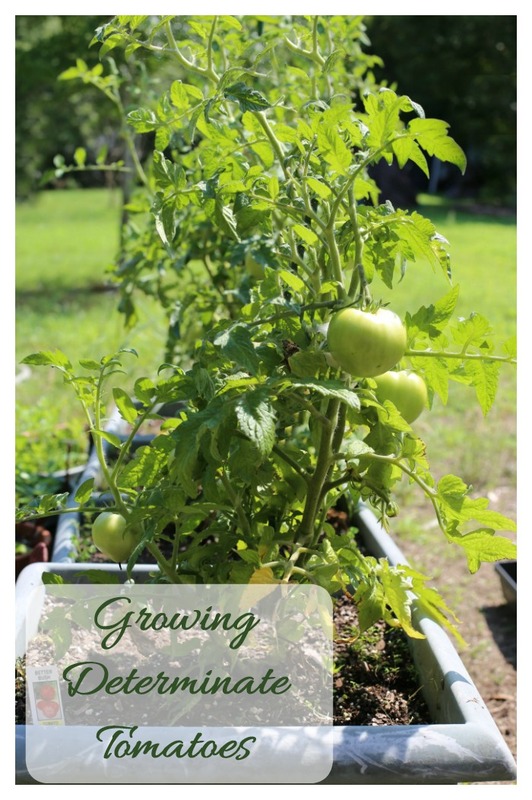 Tomato plants grow easily from cuttings.